A Mote or a Beam? Each and every single on of the coins in this photo, were it to 'surface' (from underground) on the international antiquities market or in the shops of ANY of the dealers belonging to the trade associations of the coin trade would appear without any paperwork, with the buyer expected to unquestioningly accept the 'assumption' that they came - not from a stash of decontextualised loot like this - from some 'old collection' of bygone years. I see that everybody's favourite antiquities trade lobbyist Peter Tompa is trying to argue that these items are not worth much (a proposition I would find hard accepting - not being able to see what is on those coins - maybe Tompa knows) and that they might not be from 'grave robbing' but "merely" surface metal detector finds, so that is somehow OK. Past experience shows that he is unlikely to be able to actually argue that point in an informed and coherent manner. So he'll not try, the aim of all the advocates for commercial/collectors rights over antiquities is in any case not so much to participate in any discussion as an equal partner, but simply to try to throw a spoke in the wheel of other people's. That is all they are capable of attempting. Like most people in the antiquities collecting world (especially in the US), Bailey and Ehrenburg's cultural property expert 'Peter Tompa really does seem unable to cope with opinions divergent from his own. So today I find myself blocked from reading and replying to the Global Heritage Alliance twitter feed. That's a cowardly move by a 'lobbyist' who has blocked me from every other bit of the social media he is associated with. I would ask, however, just how this reflects on the competence of Mr Tompa is to present any kind of a case for the antiquities market or collectors, if he is simply unable to answer the issues raised by those on the other side of the debate. How can we reach any kind of consensus or compromise, if the tub-thumpers of the antiquities lobby only feel comfortable when they are surrounded by (the same group of) yes-men? I think the answer is clearly that we cannot, and the kind of behaviour we see their lobbyists exhibiting is simply a symptom of the way that they are alienating themselves from the heritage debate, and will inevitably lose ground to those who are not afraid to wade in and raise issues about what the commerce in and collecting of archaeological objects involves. So what is the point of being a spokesman for the trade who will only talk with yes-men? Turkish police said on Thursday they had [seized] thousands of artefacts dating back to Anatolian, Greek and Egyptian civilizations in the largest operation to combat smuggling of ancient treasures in the country’s history. Among the items recovered were a golden queen’s crown with an inscription of the Hellenistic god, Helios, a bust dedicated to Alexander the Great’s conquest of India and a statue of a goddess dating back to the Hittite era 3,000 years ago. The 26,456 objects recovered also included Egyptian-origin statues and Phoenician-type teardrop vials. 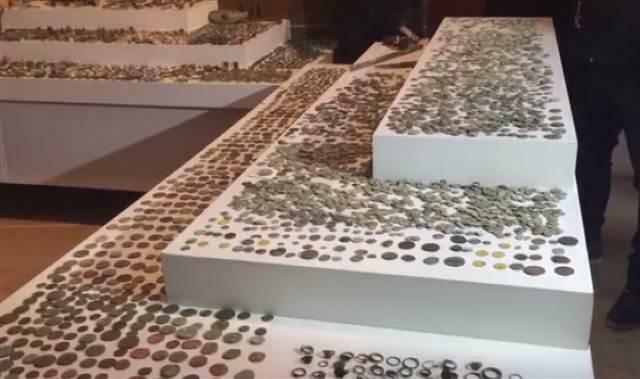 “The retrieved artefacts are... more valuable than the artefacts in the inventory of an average size museum,” Istanbul police said in a statement. 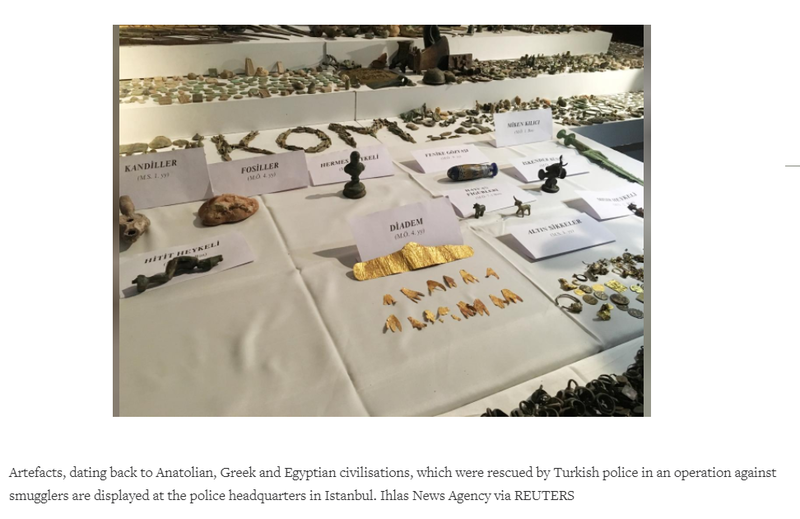 For three months the investigation, dubbed “Operation Zeus”, tracked the smuggling ring, which aimed to take the artefacts abroad and sell them to museums and collectors for millions of dollars, it said. Six people involved in the ring were detained on Dec. 12 in Turkey’s northwestern province of Duzce as they attempted to sell off some of their haul. Seven more were detained in four different provinces [addendum: in Kars, Rize and Çanakkale]. These Turkish sellers were trafficking items from all over, while some were probably of origin in Turkey, the mention of 'Egyptian-origin statues and Phoenician-type teardrop vials' suggest that they were taking artefacts from a variety of middlemen - and so there is no reason to exclude that they were selling (no-questions-asked) items looted in neighbouring Syria. Any foreign dealer buying items from these guys could not possibly know who'd brought the stuff to market - so how can they deny handling objects looted by groups such as ISIL? The same story is given in Hurriyet Daily News ('Nearly 26,500 ancient artifacts seized in biggest operation in Turkey’s history', December 21 2017). This gives the information that 13 suspects have been detained so far. The Somerset FLO said 'carry on'? Is that what the Revised Code of Practice for Responsible Metal Detecting in England and Wales says? No? So why is the FLO telling them differently? 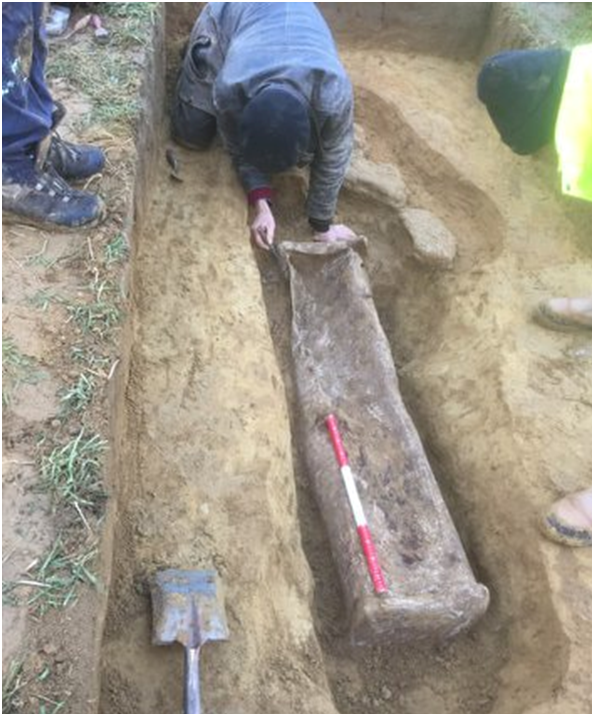 This coffin is well below plough level and should not be being dug up on an otherwise unthreatened site. This should not be regarded by the PAS as a 'prime example of responsible detecting' and is not in any way commendable. It's 'brooches' Mr Massey. Jason Massey: 'It's a young female of 5ft but the side has collapsed'. Jason Massey: 'Yes mate on my group Christmas dig. Read the full article mate'. 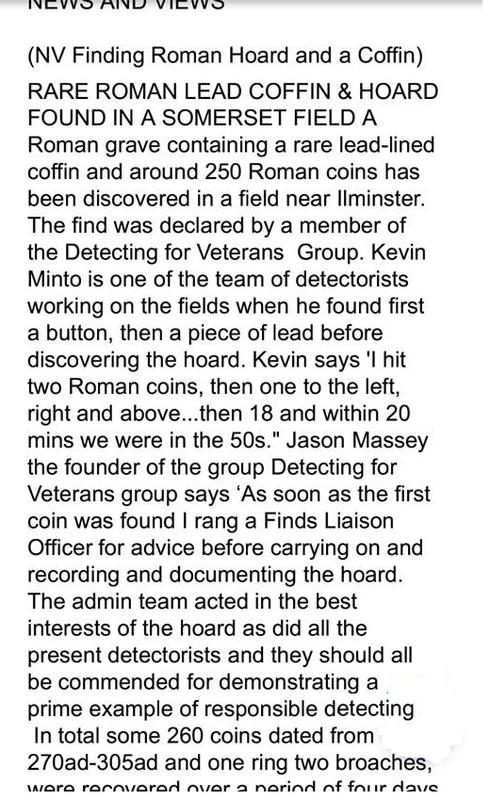 A Roman grave containing a lead coffin and more than 250 coins has been discovered in a field [...] Kevin Minto, from Detecting for Veterans - a group for ex-services personnel, discovered the coins and then found the grave when he returned to the site with the county archaeologist, Bob Croft. Mr Minto said [...], the archaeologists are chuffed to nuts and they'll do whatever they have to"
Of course the archaeologists would not 'have' to do any of this keyhole archaeology if these Treasure hunters had not irresponsibly disturbed the site in the first place. There is a 'Code' for artefact hunters, what about the archaeological codes of conduct, what do they say about underresourced keyhole digging into a potentially complex site which is unthreatened by anything much except by grabby metal detector users engaged in collection-driven exploitation of the site? and I think it is brilliant. Wannabe Citizen Archaeologist: "Code of Practice?" Wassat, then M8? Eh? What is the point about a Code of Practice for Responsible Metal Detecting (sic) in England and Wales when you've got people like this in the hobby? Jack Lee Davies‎ to Metal detecting 4 mins ·Hi evryone. Hope your (sic) all ready for Xmas! Just curious about something and couldn't think of a better place to start the questioning. Please and thanks in advance! Are you aloud (sic) to dig on a non scheduled site even know (sic) its clearly a tumuli (sic)/burial mound. Have a Roman villa site with Roman spring and river. The spring and surrounding bank is (sic) full of Roman coins. Have noticed a burial mound with river splitting and diverting around the mound. To my knowledge the Romans didn't use mounds but there has (sic) been several high status Saxon finds and the odd Celtic brooch in the same area so age of the mound isn't my main concern. Have permission to excavate from land owner next summer but didn't want to proceed if I need to alert any other authorities. Thanks again"
The Revised Code of Practice says nothing about digging collectable-mining holes in the middle of known sites (!) but there is point 2 in the section 'while you are metal detecting', but then what's the point of that if it stands to reason that by touching an unthreatened site like this you are bound to precipitate a 'point two-situation'. Bonkers. The '20 Years of Treasure' lecture by Dr Michael Lewis is available online. 'Now, obviously, Treasure is a very emotive word for archaeologists, [...] to be truthful there is [sic] some underlying tensions, from time to time'. No, the tension comes from the fact that archaeology is the opposite of everything that is presented by the PAS as 'citizen archaeology' but is really for the most part selfish collection-driven exploitation of the archaeological record, a name Mike Lewis avoids using. It beats me why, every time the PAS talks about itself, they churn out exactly the same story, 'how we came about', 'what we do', 'here are some histograms to show how well we are doing', 'here's some stuff people have found and shown us'. So for 34 minutes we learn absolutely nothing new about the scheme - a scheme let it be recalled whose mission has been for twenty years to spread awareness of itself and what it does (and the results of that) to the public as a whole. Their constant regurgitated repetition of the same boring old stuff, time and time again when they present themselves in a talk or book chapter, suggests what they really think the results of 20 years expensive outreach actually are. Commercial Artefact Hunting Rallies: Is Participation 'Best Archaeological Practice'? In the revision of the Code of Practice for Responsible Metal Detecting (sic) in England and Wales', the intention was to define what Mike Lewis announced was 'best archaeological practice' - remember the BM reckons (falsely in my view) that those involved in collection-driven exploitation of the archaeological record are some form of 'citizen archaeologists'. In that case, I am puzzled by the complete absence here (as was the case in the 11-year old one it supersedes) of any mention of participation in distant one-off mass commercial artefact hunting rallies. In the frame of this new revised Code, is participation in them some form of ‘citizen archaeology’ or ‘best archaeological practice' or is it just grabby greed? Metal detectorists wanting to do right and what is accepted as 'responsible' are left in the lurch if they examine this code for guidance on this question. 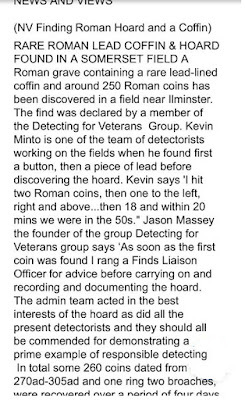 This question is quite important as these rallies (and related group 'club digs') are a significant way in which UK metal detecting artefact hunters-collectors 'interact with the past' and artefacts randomly grabbed in such events are a substantial component in the PAS database (when I asked, the PAS refused to say how many - which is telling). So why is this missing from the CoP? There’s been reason for cheer in metal detecting circles, with the news this month that 2016 saw a record number of [Treasure PMB] finds reported to the Portable Antiquities Scheme. This announcement has spawned numerous congratulatory reports – including in the Guardian – detailing the wonderful things found, the back-stories of the lucky finders, and the sometimes extraordinary sums of money their finds have fetched. The rise in finds is attributed to improved detector technology and an increase in the number of people taking up the hobby [...]. Within the archaeological community the response has not been quite so cheerful. Several archaeologists have complained to me about the Guardian appearing to promote metal detecting as a harmless leisure pursuit, and online there’s been a distinct rumble of archaeological discontent. The problem lies in fundamentally conflicting aims. Archaeologists primarily value information about the past; objects are important, but only within their archaeological context – their relationship to structures, deposits and the full range of finds – contributing to the wider understanding of a site or landscape. For metal detectorists, the primarily focus is the objects themselves, the collection of which by detectorists divorces an object from most of the information which makes it valuable to an archaeologist. However, it would be a mistake to think that archaeologists now live in perfect harmony with detectorists; distrust on both sides still bubbles under the surface. 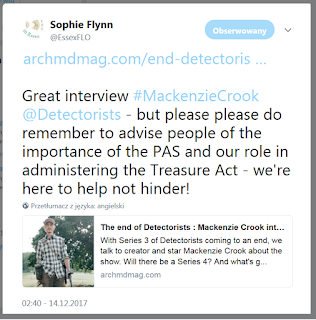 Many parts of the metal detecting community remain wary of archaeologists, suspecting (probably rightly) that, if they could, archaeologists would place greater restrictions on metal detecting. On the other side, most archaeologists privately believe that even responsible detectorists to do more harm than good, and the more extreme among them see all metal detectorists as little more than legalised looters driven by personal greed. For many archaeologists cooperation is a form of damage limitation; the least worst solution. Metal detecting encompasses a wide range of individuals, from the responsible society members with a genuine interest in the past, to the criminal Nighthawks, and all the detectorists who occupy the large grey area in between. The innocent and honest majority, groups like the cuddly, nerdish club depicted in Detectorists, champion metal detecting as a citizen scientist movement, democratising knowledge and encouraging a love of heritage. The problem for archaeologists is that metal detecting is fundamentally acquisitive, competitive, and potentially lucrative. And there Ms Shepperson loses me, with that word 'majority'. How do you know Ms Shepperson? When the vast majority of artefact hunters with metal detectors do not record any finds with the PAS, how can you claim that its a cuddly majority and a [s]pikey minority? Its better out of the ground and in your hand for the history or monetary value rather than left in the ground to rot doing nothing for anyone. In love with Mr Deus for ever. Archaeological evidence can indeed 'do nothing' if instead of being preserved in the archaeological record, it is in Gwawrer's hand or pocket - or flogged off on eBay. What do you think of the UK’s new revised Code of Practice and the altered definitions of “responsibility’ they embody? Why did it appear without fanfare and without the endorsement of the two main detecting bodies, but only archaeological ones, including the CBA? 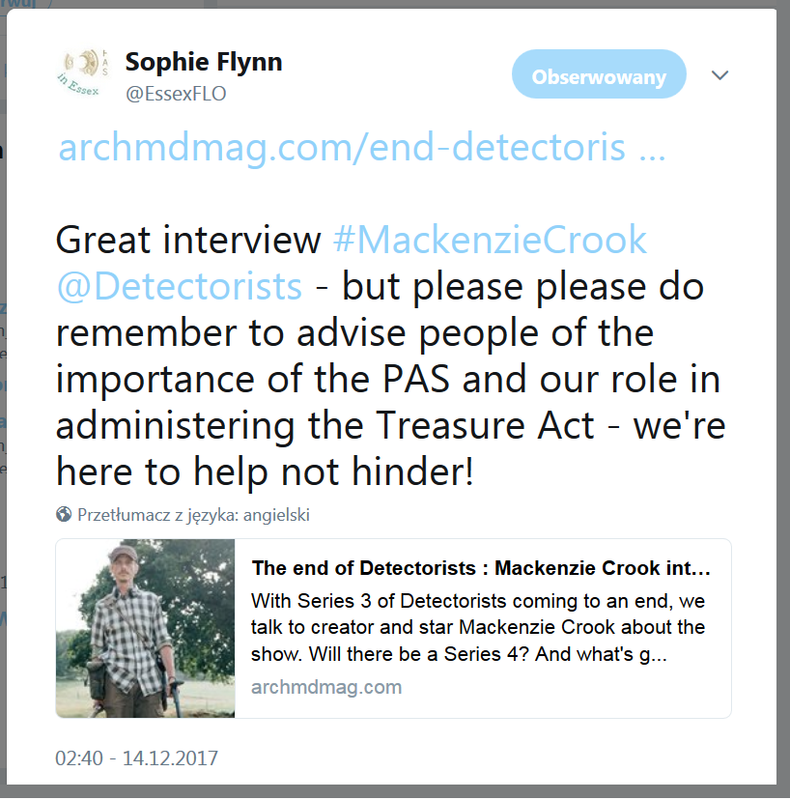 http://paul-barford.blogspot.com/2017/12/colourful-post-on-revised-code-of.html Why are the UK detectorists pretending to be unaware that the carpet has been pulled out from under their feet over several issues? Also announced was an updated Code of Practice for Responsible Metal Detecting in England and Wales, which provides guidance on best archaeological practice for finders. [...] Michael Lewis, Head of Portable Antiquities and Treasure at the British Museum, said [...] The new Code of Practice for Responsible Metal-Detecting in England and Wales outlines exactly what is expected if people want to help archaeologists better understand our shared past." If people want to help archaeologists understand the past, they'd stop ripping the diagnostic artefacts out of the archaeological record and pocketing it for themselves. Below, we will see if this document actually proposes anything near 'best archaeological practice' (it does not) or 'outline' what an artefact hunter would have to do to record the context of deposition and discovery of the artefacts they hoik (it most certainly does not). So here is my analysis of the Code of Practice for Responsible Metal Detecting in England and Wales (2017) [available here: https://finds.org.uk/getinvolved/guides/codeofpractice]. The old one is still available (here for the moment, download it as PAS-supporters tend to scrub the Internet of old texts documenting how they subtly change their 'mission'). If undertaken responsibly[,] metal-detecting can make an important contribution to archaeological knowledge. This document aims to provide guidance for metal-detectorists who wish to contribute to our understanding of the history of England and Wales. It combines both the requirements of finders under the law, as well as more general voluntary guidance on accepted best practice. This whole preamble was missing from the original, which began 'Being responsible means:'. Just for the sake of discussion, let us just ignore the fundamental quibble that I would have whether there is actually something that we can call 'responsible' Collection-Driven Exploitation of the Archaeological Record - I say that is an oxymoron from the beginning. Neither do I think that when you look at it more carefully, the 'contribution to archaeological knowledge' is as important as supporters of relic-collecting pretend, and certainly does not compensate for the enormous destruction being done by Collection-Driven Exploitation of the Archaeological Record. This has nothing to do with not enough items being reported, but that is an added issue which needs to be taken into account in any discussion on this. Is it responsible to take part (no matter how thoughtfully) in a hobby which in its current form is so destructive? 1. Not trespassing; before you start detecting obtain permission to search from the landowner, regardless of the status, or perceived status, of the land. Remember that all land (including parks, public open-spaces, beaches and foreshores) has an owner and an occupier (such as a tenant farmer) can only grant permission with both the landowner's and tenant's agreement. Any finds discovered will normally be the property of the landowner, so to avoid subsequent disputes it is advisable to get permission and agreement in writing first regarding the ownership of any finds subsequently discovered. (see www.cla.org.uk / www.nfuonline.com). 2. Adhering to the laws Obeying the law concerning protected sites (such as those defined as Scheduled Monuments, Sites of Special Scientific Interest or military crash sites, and those involving human remains: you can obtain details of these from the landowner/occupier, Finds Liaison Officer, Historic Environment Record or at www. magic.gov.uk)., and also those other sites on which metal-detecting might also be restricted (such as land under Countryside Stewardship or other agri-environment schemes). You can obtain details of these sites from several sources, including the landowner/occupier, your local Finds Liaison Officer or Historic Environment Record or at http://www.magic.gov.uk / https://historicengland.org.uk/listing/the-list/http://cadw.gov.wales - which will help research and better understand the site. Take extra care when detecting near protected sites since it is not always clear where the boundaries of these lie on the ground. 3. You are strongly recommended to join a metal detecting club or association that encourages co-operation and responsive exchanges with other responsible heritage groups. Details of metal detecting organisations can be found at www.ncmd.co.uk / www.fid. newbury.net. 3. Familiarising yourself with and following current conservation advice on the handling, care and storage of archaeological objects (see www.finds.org.uk). the Portable Antiquities Scheme (including contact details for your local Finds Liaison Officer - see http://www.finds.org.uk / 0207 323 8611), and its guidance on the recording of archaeological finds discovered by the public; make it clear to the landowner that you wish to record finds with the Portable Antiquities Scheme. Ensure that you follow current conservation advice on the handling, care and storage of archaeological objects (see https://finds.org.uk/conservation/index). 4. Obtaining public liability insurance (to protect yourself and others from accidental damage), such as that offered by the National Council for Metal-Detecting or the Federation of Independent Detectorists. The most notable deletion here is the bit about joining a metal detecting club. It would be interesting to know why this is. Surely a club with rules and where members can help each other, discuss ethical issues in groups are the sort of places where 'responsible' behavior has more of a chance of being fostered than among scattered 'independent' detectorists doing what they want where they want with nobody knowing. Also, club meetings are one of the places where FLOs meet detectorists, spread the message of (and answer questions on) best practice, and pick up finds for recording. The deletion of this point is only comprehensible if the authors of this text now think (after experience with them?) that it is irresponsible to be a member of a metal detecting club, which is an interesting development. 'Being responsible means.... [keeping away from clubs and club digs]? 'Military crash sites', that seems very redolent of the 'Newark Torc debacle' (see here too). Something the PAS no doubt would rather we forget. Several cases of artefact hunters digging into graves come to mind, like for example that lead coffin four feet down at Atherstone (with the archaeologists joining in with the ethically-dubious 'fun') or the Holborough grave under a mound on a known Early Medieval burial ground trashed by the "Medway History Finders" . What is this stuff about 'sources, including the landowner/occupier, your local Finds Liaison Officer or Historic Environment Record or ... which will help research and better understand the site.'? In what way is the word 'research' used here, research as in 'citizen archaeologists' (ha ha) or reseach as used by collectors to identify potentially productive sites for selfishly hoiking out artefacts willy-nilly to fill their pockets for personal entertainment and profit. If the latter, I would question, and very strongly if this can in any way be considered by the bodies 'endorsing this code' as a 'responsible' use of archaeological databases. There is nothing here about participation in commercial artefact hunting rallies, which is a huge omission, considering the extensive experience we have now had of them since the first code was written. Is it, for example 'responsible' ever to take part in one, or take part in one given certain circumstances? Also, for goodness' sake, what about targeting known sites? Is the practice, widespread in tekkie circles, of 'researching' where known sites are in order then to get permission to hoover out collectables from it in any way archaeologically responsible action? Of course not, unless the material is recovered in such a way and documented and reported in a manner that it is possible to integrate the new information with that already known from archaeological research - rarely achieved. This question is totally absent from both Cods of Practice - why? 1. Wherever possible Working on ground that has already been disturbed (such as ploughed land or that which has formerly been ploughed), and only within the depth of ploughing. If detecting takes place on undisturbed pasture, be careful to ensure that no damage is done to the archaeological value of the land, including earthworks. Avoid damaging stratified archaeological deposits (that is to say, finds that seem to be in the place where they were deposited in antiquity) and /6 minimise any ground disturbance through the use of suitable tools and by reinstating any excavated material ground and turf as neatly as possible. Endeavour not to damage stratified archaeological deposits. 2. Stopping any digging and making the landowner aware that you are seeking expert help if you discover something below the ploughsoil, or a concentration of finds or unusual material, or wreck remains. Your local Finds Liaison Officer may be able to help or will be able to advise on an appropriate person. Reporting the find does not change your rights of discovery, but will result in far more archaeological evidence being recovered. 3. Recording findspots as accurately as possible for all archaeological finds (i.e. to at least a one hundred metre square, using an Ordnance Survey map or one ten metre square - an 8-Figure National Grid Reference), using a hand-held Global Positioning Systems (GPS) device whilst in the field or a 1:25000 scale map if this is not possible. Bag finds individually and record the National Grid Reference (NGR) on the bag, recording the National Grid Reference on the bag with a waterproof/ indelible marker. Archaeologists are interested in learning about all archaeological finds you discover, not just metallic items, because such finds contribute to knowledge. Findspot information should not be passed on to other parties without the agreement of the landowner/occupier (see also clause 9). 4  Respecting the Country Code (leave gates and property as you find them and do not damage crops, frighten animals, or disturb ground nesting birds, and dispose properly of litter: see www.countrysideaccess.gov.uk). https://www.gov.uk/government/publications/the-countryside-code). It always seemed a very wonky notion of 'responsible' to condition keeping off undisturbed sites under pasture by 'wherever possible', so I am glad to see that gone. It is IRresponsible digging any kind of holes in such a site (like the Crosby Garrett helmet site, or Lenborough earthwork site under pasture and many other places irresponsible oiks go to hoik finds to pocket). So equally, it is good to see them tightening up the equally rubbishy phrase: 'If detecting takes place on undisturbed pasture...', the message now is an unequivocal 'just keep off , exercise some self-restraint'. Good. The new explicit phrase 'Being responsible means.... Avoid damaging stratified archaeological deposits ' is welcome. Anyone damaging archaeological deposits under the ploughsoil (like those ruffians that dug up the 'somewhere-in-Gloucestershire-healing-doggie' hoard that FLO Kurt Adams refused to condemn) are hereby well-and-truly put in the league of Irresponsible Metal Detectorists. And quite rightly so. The ''Being responsible means.... 2. Stopping any digging ...' bit is moved - in the old Code it was inexplicably in the 'after you've been detecting' bit (which is telling, it means the authors of the first Code saw a distinction between 'detecting' and 'digging to add to a collection', nice to see them waking up a decade on). Again anyone who does not STOP digging and immediately initiate procedures to get it sorted out is IRresponsible (and in a treasure case should clearly thereby forfeit the reward). What is not covered is who should bear the responsibility of paying for the intervention necessitated by the artefact hunter searching an otherwise threatened site and themselves in pursuit of personal gain causing a situation where an intervention is necessary. Should this not be a 'polluter pays' situation? What is 'responsible', washing hands of responsibility for the consequences of one's own actions? There is however an extraordinary omission. As we know, the model is that through recording what finders find, the PAS is creating information to replace what is lost. If this is to go beyond the nineteenth century artefact-centred approach (suitable only for broad, Kossinnist-style, dot distribution maps of regional distribution) we need to be getting real information about context of discovery from the finders. The Code should say what best practice means is not just picking up what is to go into a collection and ignoring the other components of the artefact scatter it came from. What is 'collecting best practice' in terms of archaeological information generation? In order to understand the information about the artefacts from a site in a way that near-mitigates their removal, we need far more than 'I found that there'. Selectively removing surface evidence from patterned assemblages not only removes potentially significant diagnostic artefactual evidence from those patterns without any understanding of those patterns, but utterly distorts that pattern. The information removed needs to be observed in context, correctly documented and preserved by record before we can talk of any 'best practice'. That aspect is totally missing from this document. 1. Reporting any finds all archaeological finds to the relevant landowner/occupier; and (with the agreement of the landowner/occupier) to the making it clear to the landowner that you wish to record archaeological finds to the Portable Antiquities Scheme, so the information can pass into the local Historic Environment Record. Both the Country Land and Business Association (www.cla.org.uk) and the National Farmers Union (www.nfuonline.com) support the reporting of finds with the Portable Antiquities Scheme. Details of your local Finds Liaison Officer can be found at www.finds. org.uk, e-mail info@finds.org.uk https://finds.org.uk/contacts, e-mail info@finds.org.uk or phone 020 7323 8611. 2. Abiding by the statutory provisions of the Treasure Act 1996, and the Treasure Act Code of Practice (www.finds.org.uk/treasure) and wreck law (www.mcga.gov.uk) (https://www.gov.uk/government/organisations/maritime-and-coastguard-agency) and export licensing (www.mla.gov.uk). If you wish to take artefacts and archaeological material older than 50 years old out of the UK, you will require an export licence (http://www.artscouncil.org.uk/). If you need advice your local Finds Liaison Officer will be able to help you. 3. Seeking expert help if you discover something large below the ploughsoil, or a concentration of finds or unusual material, or wreck remains, and ensuring that the landowner/occupier’s permission is obtained to do so. Your local Finds Liaison Officer may be able to help or will be able to advise of an appropriate person. Reporting the find does not change your rights of discovery, but will result in far more archaeological evidence being discovered. 4. Calling the Police or HM Coastguard, and notifying the landowner/occupier, if you find anything that may be a live explosive, device or other ordnance: do not use a metal-detector or mobile phone nearby as this might trigger an explosion.. Do not attempt to move or interfere with any such explosives. 5. Calling the Police if you notice any illegal activity whilst out metal-detecting, such as theft of farm equipment or illegal metal-detecting (nighthawking). Further details can be found by contacting Historic England/Cadw or the 'heritage crime' contact within your local police force. This section is still awfully muddled and shows the same wozzy thinking that was in the first Code. First of all the intention to record archaeological finds to the Portable Antiquities needs establishing before 'detecting' them, and not after. Likewise, as the Nighthawking Report showed (recommendation 7), it is not enough merely to 'report' finds to the landowner, but get title individually signed over to the finder before they are taken away (and for instance placed in the hands of an employee of the PAS) . In the case of British artefact hunters, the point about export licence requirements should unequivocally read: 'If you wish to send artefacts and archaeological material older than 50 years old out of the UK, you will require an export licence' as this is the mechanism by which archaeological evidence is most often turned into a commodity. As noted above, the original point about 'finding something large below the ploughsoil' has been moved up. The human remains has had 'a likely burial' added, an archaeologist would be useful here though, not just the police. There is nothing here about the artefact hunter writing anything up themselves. Yet the PAS data fields are not sufficient to record everything that could be said about the objects found in a field, their patterning and what happened to them. Likewise, there is nothing here about the form in which a 'responsible' artefact hunter uses or disposes of their collection. Does a 'responsible' artefact hunter sell finds for example? Who to, how, and accompanied by what documentation? The final point in this section is highly interesting: 'Being responsible means... informing the authorities 'if you notice any illegal activity whilst out metal-detecting', that stands to reason, and is no more than what any responsible citizen should do, no matter where they are and what they are doing at the time. What is interesting is that artefact hunters are being explicitly called upon to 'snitch' on fellow artefact hunters. The significance of this is that one will very frequently hear 'you all know who is involved' in illegal artefact hunting (like at Glemsford, known to Sukisal, or another local detectorist who knows some; Norman Smith knows some too). These people are now automatically declared by the New Code of Practice 'irresponsible' if they do not report their knowledge of these people and their activities to the police. And so they are. This is the automatic corollary of the 'we are not nighthawks, we hates them' defence. So let us see a massive reporting now of nighthawks known to the British artefact hunting community. § You can find out more about the archaeology of your own area from the Historic Environment Records maintained by local authority archaeology services (in England) and the Welsh archaeological trusts (see contact lists at www.english-heritage.org.uk/server/ show/nav.1549 and www.ggat.org.uk/fourwelshtrusts.htm). Also the Heritage Gateway - http://www.heritagegateway.org.uk (in England) and Archwilio - http://www.archwilio.org.uk (in Wales). § For further information about the recording and reporting or finds discovered by the public and the Treasure Act 1996 contact the Portable Antiquities Scheme (www.finds.org.uk / info@finds.org.uk / 0207 323 8611). § For further information about how you can become involved in archaeology contact the Council for British Archaeology (tel 01904 71417 / www.britarch.ac.uk) who (www.archaeologyuk.org / 01904 671417). They can also supply details of local archaeology societies. § You can find out about metal detecting via the National Council for Metal Detecting (www.ncmd.co.uk) or the Federation of Independent Detectorists (www.fid.org.uk). This is interesting, the original Code was written under the assumption that these people would be interested in 'finding out about archaeology'. Well, they are not, they are collectors and few collectors of costume barbie dolls will be contacting the local ethnographic society, and - apart from the non-judgmental FLO that legitimates their hobby - few artefact hunters are in any way interested in rubbing shoulders with archaeologists. So the Code's authors added a bit about 'Being responsible means... finding out more about metal detecting'. Bonkers. You can find out more about the archaeology of your own area by joining a library and borrowing a few books. This Code of practice is voluntary, but the following organisations have endorsed it has been endorsed by: National Council for Metal Detectorists, Museums, Libraries and Archives Council, Country Land and Business Association, Federation of Independent Detectorists, Royal Commission on Ancient and Historical Monuments Royal Commission on the Historical and Ancient Monuments of Wales, Council for British Archaeology, Amgueddfa Cymru - National Museum of Wales / PAS Cymru, Society of Museum Archaeologists, British Museum / Portable Antiquities Scheme, National Farmers Union, English Heritage Historic England, Association of Local Government Archaeological Officers, Chartered Institute for Archaeologists, Institute for Archaeology (University College London). This final section is interesting. Leaving aside that some of the organizations that consulted and then endorsed the original code have now changed names or disappeared (and one body who refused to endorse the original code now has), it is extremely interesting to note that this version of the Code appears without the endorsement of the NCMD and FID. That is highly significant. I am disturbed to see that my alma mater the Institute for Archaeology University College London has stooped to endorsing Collection-Driven Exploitation of the Archaeological Record - I wonder whether that applies too to the areas of the Middle East where they do their research (and if not, how do they explain the illogicality of that?). Bonkers. Who else? The militants' last vestiges of territory are coming under severe strain by a wide array of rivals. It is only a matter of time before militants are driven to rugged hideouts in Homs and in the Euphrates Valley region. But as military battles subside across the country, a slow-grinding and methodical campaign should kick off to prevent an ISIS resurgence. “To properly talk of a victory over the group, the conditions that gave rise to them must be eradicated. By that, I mean that people must improve their living conditions, be granted better access to political structures and to be able to exert their agency in whatever way they wish,” Mabon said. “To fully defeat ISIS, such conditions must be addressed, preventing grievances from emerging that force people to turn to groups such as ISIS as a means of survival,” he added. However, with military operations against militants still underway, there has yet to be any significant attempt to battle the ideological residues of the group or address the grievances that led to its emergence. Also of course, preventing them regrouping involves cutting off as many of their potential sources of revenue, and - whether selfish collectors like it or not - that means making sure nobody can easily monetise illicit antiquities. That is obvious to all but empty-brain traders in trophies of the past. 2) 'The Calf Bearer': In October, a marble torso, circa the 6th century BC. was recovered from a private owner who acquired the artifact after it too was 'stolen during the Lebanese Civil War, and sold to private collectors'. Nobody is on record as having been arrested. The value of the object to the market was approximately $4.5 million. 3) 'Torso E1912: In November, a marble torso, circa the 4th century B.C.E., was recovered from a private owner who acquired it after the statue was 'stolen during the Lebanese Civil War and sold by an antiquities dealer before being shipped to New York.' Nobody is on record as having been arrested. The value of the object to the market was not stated. Pictured (from l-r): Torso E1912; the Bull’s Head; and the Calf Bearer. Note here totally missing are any of the names of the three collectors involved in buying artefacts with unverified licit origins. We know the name of the owner who lost his bull head (but seems to have kept the stand) but the October and November seizures seem to have gone relatively untrumpeted - why? One may speculate whether or not the fact that these three items were found and seized so close together in time indicates that somebody implicated in their trafficking was induced to 'talk' about their clients. The Sidon head was the one seized first and interestingly, had been 'bought from a dealer in London in 1996 for more than $1 million and then sold it to another collector'. The dealer is unnamed. Can one speculate that this hypothetical London dealer had pressure put upon him or her somehow and revealed the name of a client in New York who'd bought 'the calf Bearer' and who maybe had just shipped a third piece (torso E1912) to New York where the DA could seize it? That is an interesting possibility, especially when one would consider how a New York DA would pressurize a hypothetical British dealer to do anything at all... also it raises the question what else such a hypothetical dealer might have shipped out to places where the Manhattan DA cannot touch him? I rather think there was a message being sent out by the display and repatriation of these three objects together. I think we might watch the doings of the reformed Scotland Yard Art and Antiquities Squad with some interest. And a final thought for collectors: You may think you can 'trust' the 'reputable' dealer in the shiny shop who has a trophy antiquity that you covet but - he regrets - somebody has mislaid the paperwork for. But the moment American (let's say) investigators get him or her in their sights and make them 'an offer they cannot refuse' (like not go to jail if you co-operate), they'll have no compunction about dredging their business records for the names and addresses of people that have bought dodgy items from them, no-questions-asked. No compunction. (Michael Lewis, head of portable antiquities and treasure at the British Museum, following the announcement that a record amount of ‘treasure’ was found in Britain’s fields and ditches by member of the public during the past year). 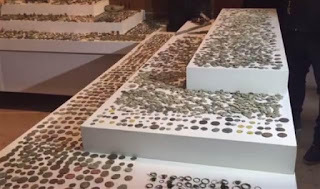 The point about this is that the metal detector as a tool can make a contribution, but collection-driven exploitation of the archaeological record, as its name implies, can only be exploitive and erosive. Which is probably why Mike Lewis does not call a spade a spade. Manhattan District Attorney Cyrus R. Vance, Jr., today announced the formation of the Manhattan District Attorney’s Office’s first-ever Antiquities Trafficking Unit [...] When a new matter is brought to the attention of the assistant district attorneys, analysts, and paralegal who staff the unit, a team is assigned to collect information about the origin of the item in question, potential criminality with respect to its possession, and the trafficking network, where applicable, associated with the movement of the artifact. From there on, members of the unit work closely with partners in law enforcement and foreign governments to gather the evidence needed to seize the item, prosecute criminal offenders, and return the artifact to the rightful owner. This unit will formalize the collaborative processes and partnerships that led to the previous successful recoveries proudly listed in the press release. It is time London got one, focussing specifically on the massive antiquities trade which passes through it, rather than one that treats the issue as just part of the wider 'art and antiques' market. "help" who do what Sophie? There's more to "local heritage and heritage" than a few loose coins pulled out of a field somewhere. We left the object-centric view of the past in about 1870 - PAS promotes a very atavistic 'view of the past', don't you think? Not a boring question - quite a fundamental one. What is "responsible", please, about any form of *Collection Driven Exploitation of the Archaeological Record*? Can looting in Syria, Egypt etc be made "responsible' by installing a PAS-clone in Damascus or Edfu? Or Central America? Fundamental question, have you an answer?
" I shan’t bore you [emoticon]". I assure you, you will not bore me if you give proper answers to my questions, its the superficial ones which we've all heard mindlessly chanted like a mantra so many times before that are the boring and intellectually bankrupt ones. Right, start holding your breath... now. No, don't. She's probably awaiting instructions from Bloomsbury. The antiquities trade always destroys knowledge.